I know it's silly, but I've been putting off writing the Day 6 post about Kyle's & my last day at Walt Disney World. You guys know me: I'm a crier, so it should come as no surprise that I had a hard time with this day. I'm ahead of myself again, so I'll stop and try to chronicle our last day. Also, I'm waiting until the end of the post to embed the video because it sums up the trip. 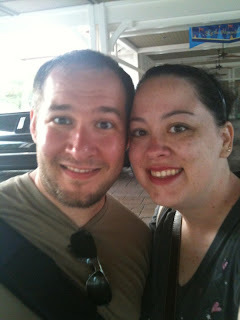 We started by getting up super early to finish packing and take our checked bags to the airline counter at our resort. That's one of the great perks of staying at a Disney resort: they'll print your boarding pass, deliver it to your room, check your luggage, and take it to the airport for you! Makes for a much simpler last day. Anyways, I woke up really really nauseous. (At this point I was fairly certain Kyle thought that I'm always sick, but I swear I'm not!) My body was dying for the comfort of my bed, but my heart wanted to stay a few more days with my good friend. It was a pretty quiet morning. We were kinda happy not to be going there! Since no one really leaves the Magic Kingdom area in the morning, we had a private boat ride to the resort. Whispering Canyon Cafe was similar to 50's Prime Time Cafe in how the waiters and waitresses "played with" the diners. They mostly stuck to teasing the kids, but they still messed with us a little. If one asked for ketchup, they called for all the ketchup in the restaurant to be brought to that table! Our waitress asked us if we needed any, and when I laughed and said no, she said "don't be scared!" in a tone that worried me a little. ;-) By the way, I thought she sounded just like Roz from Monsters, Inc.
We got the All You Care to Eat Breakfast Skillet. 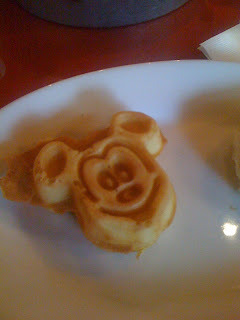 Despite still not feeling great, I decided to power through and have a couple of Mickey waffles. Yum!!! I also tried biscuits and gravy. I must be the worst Southern gal ever: I thought they were disgusting! Of course I also don't like sweet tea (or any tea for that matter) and didn't like grits until I was 26. So yeah, me being Southern has been called into question a few times. 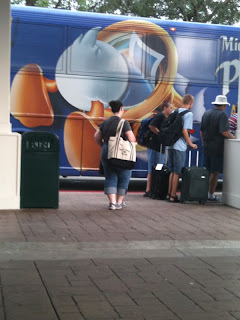 After a leisurely breakfast (where Kyle was sung to and given a birthday cupcake one last time), we headed to the bus stop to take the bus over to Hollywood Studios. When we got to the bus stop, I heard someone call out, "Joanna?" It was a woman from work, so we visited with her and her family until their bus came. Was great to see her, and she snapped a pic of her and me to text to our principal. Haha! Our bus took about 45 minutes to come. Some people called about it, and one finally got there. 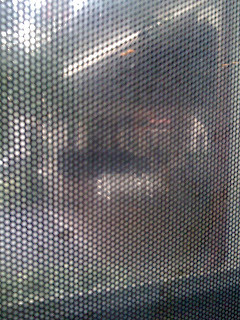 Possibly the worst bus wait we had, but looking back, it didn't feel that awful to me. Hollywood Studios was crazy crowded, so we rode Star Tours twice and shopped around looking for a Perry the Platypus shirt for Kyle (we never found one). On the last ride Kyle finally got a Star Tours ending that was NOT the Death Star, so I think he was pretty happy. He also steered me over to Phineas & Ferb, so I could get a photo of them for the kids. 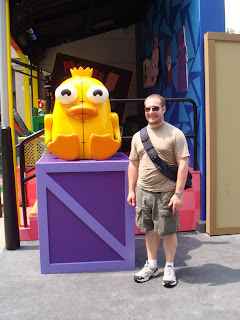 He's also a pretty big fan, so I took his photo with Ducky MoMo. Was really glad that he explained he whole Ducky MoMo thing to me. It's actually pretty hilarious, and I'd like to see that episode now. Also, I think this is the *only* picture in the photos I took of an "actual" duck. Notice that I said we sweated at Hollywood Studios? I think the heat was the worst it had been the whole trip on this day. There was no way to be girly with the suffocating heat. I mean, you try to be prissy when you feel like you're dripping sweat! Not gonna happen. The only saving grace I had was the fan I bought in China in Epcot the day before. Best $11 I spent! By the end of the trip I was quite adept at quickly popping the fan open and closed. I usually tried to get us both in the fan's breeze when we were sitting on boats or standing in queues. We took a boat from DHS to the International Gateway in the World Showcase of Epcot. As I say in the video below, it was my first time coming through that entrance, and it was excellently vacant! Me: (standing in it) Yep. Kyle: (perplexed look) Are you standing in the rain? Kyle: Do you have your poncho in your purse? Kyle: Want to go get one? Me: Nope. (pauses) Wanna join me? Kyle: (waits a beat) Yep. We then walked in the wonderfully cooling rain until it became giant drops that would knock a full grown fairy out of the sky and went into the Mexico Pavilion to take cover. The Mariachi band was playing close to the Three Caballeros entrance, so the queue was practically non-existent, and we decided to ride it one last time. Even though a family was coming through the queue right behind us, the CM's loaded us in the front seat of the boat and closed the gates and sent us on a private boat ride. Again, it was nice. We joyfully sang along with Donald, Joe Carioca, and Panchito one last time. After that we headed toward the front of the park to ride Spaceship Earth as our final ride of the trip. I find it interesting that we started and ended our trip on perpetually moving, calm rides that most children would say are boring instead of the trill rides. I liked that. Seemed fitting for us and our relaxing trip. You can tell on the video (again, below) I was starting to have a hard time with the whole "end of the trip" thing. By the time we finished Spaceship Earth, I was holding back tears. I promise I don't typically cry when I leave Walt Disney World. I know I'll be back, but the thought of leaving Kyle was really bugging me. You have to understand, we've known each other for over a year. It took over a year for us to bridge the gap between Texas and Connecticut to finally meet. We meshed so well and had so much fun that the thought of leaving someone I now consider to be a best friend and not knowing when I'd see him again was on the point of painful for me. My bus to the airport was leaving 30 minutes before Kyle's, but he went back to the resort to wait with me. While he headed off to grab lunch, I found a table, turned my back to where he was, and finally let the tears flow. Once he sat down I tried to smile, but he knew something was up and asked if I was ok, and I burst into tears again. A couple minutes later I was able to speak again *sigh* and chatted with him through lunch. We promised we'd see each other again some day, and I plan to hold him to that. We waited to go to the bus stop until the last minute, so the bus pulled up fast. When we were saying our goodbyes, Kyle pulled out his iPhone and "said one last picture?" 8 photos later we finally had one with both of us in it. ;-) The trying to get it to work right explains the looks on our faces. I love Kyle's "oh I'm being filmed" smile at 1:50. Keep in mind I wasn't feeling great, so makeup had become minimalistic, so excuse that, and towards the end I'd been crying. So there you have it! Kyle and I had a successful trip to Walt Disney World. We proved that two people can meet online, share a digital connection for a year, and get along amazingly well with minimal awkwardness when they meet for the first time in real life and spend 6 days together. To everyone who said that they admired my bravery and that they were a little jealous of my adventure, you can do this too. :) Be brave; have no regrets! It's really the only way to go about life! Hope you all enjoyed sharing our adventure with us! We had a blast sharing it with you via Twitter while we were in the parks, and I have had fun reliving it on my blog. Who knows, in 4 years you might be reading about Kyle & I going to a Deluxe resort at WDW (although I plan to go back before that)! Next Post: I'll write one last time about the trip in my next post about things that surprised me about this trip, and hopefully we'll have a guest blogger join us in the next week or two, but we'll see on that last one. John - We did have a blast! :D Sorry, I didn't get time to make shirts this trip. ;-) However, that might have given off the wrong idea about our relationship. :) Not sure when the next trip is, but I've been bugging him to go see Hanson with me at the end of October. He keeps mumbling something about being responsible and getting a place of his own. Hehe. Amy - 4 seemed logical off the top of my head. He's saving to move out from living with roommates. I'm hoping to buy a house in a year or two, so saving money is going towards that kind of stuff for now. I've been at Thanksgiving when all the Christmas decorations are up, and it was gorgeous. Next I want to see Halloween decorations. :) Feel free to keep "stalking" me. Next post will be in a few days most likely. If I didn't want people to read it, I wouldn't post it.